Garlic isn’t hard to grow. In fact, growing garlic plants is almost ridiculously easy. It has a few important requirements that are easily met: decent soil, adequate moisture, and, of course, planting and harvesting at the right time. When is the right time for planting garlic? 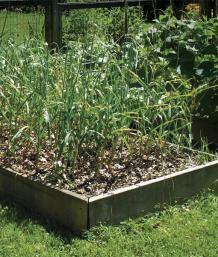 Plant garlic four to six weeks before the ground freezes in your area. You can fudge the planting time a little. I have planted as early as September (by mistake) and as late as Thanksgiving (to experiment) and have had decent crops. Roots will start to grow soon after you plant. Your aim is to get good root development before the plants go dormant. Green shoots may appear in the fall, which is fine.